Swaying palm trees, tropical beach breeze, world-class spa and tongue-twirling cuisine are all part of a collage imagery that illustrates the perfect picture of Thailand. Thailand is the ultimate destination topping travel charts not just in Asia; it is a global phenomenon for leisure and medical tourism. From Thailand’s fertility care to dental implants in Bangkok; the country’s reputation for attentive medical service and refined clinical facilities made it one of the most preferred destinations for medical tourism in Asia. In an effort to remain at the competitive edge of medical tourism, new travel regulations have been introduced to allow patients from Middle East and Gulf states including the UAE, Bahrain, Kuwait, Oman, Qatar and Saudi Arabia to enter Thailand for medical care and stay up to 90 days without visa. Family members accompanying Gulf state patients traveling to Thailand - such as parents, children, and spouse (up to 3 individuals) - can enjoy the same benefit of the 90-day visa exemption, provided they hold documents proving their relationship with the patient such as birth certificate, ID or marriage certificate. The new visa program and entry regulations are not only greard to Gulf medical tourists nationals from South Korea, Argentina, Brazil, Chile, and Peru are also eligible for the free-visa program. Citizens from the aforementioned countries traveling to Thailand for health care purposes must present to the Thai immigration check at the port of entry documents to prove they have a medical appointment issued by certified health institutions in Thailand. International patients are asked to prove they have sufficient financial support, such as health insurance, issued by authorities in their respective countries. As a result of the relaxed travel regulations, 60,000 Omanis visited Thailand for medical care in 2012 and numbers are predicted to increase to 75,000, according to International Medical Travel Journal. To maintain the momentum of medical tourist flow, some of Thailand’s health care centers have set up offices in Muscat to be able to target local Omanis seeking cost-efficient care. Oman Air is adding more flights to its weekly flight schedules on the Muscat-Bangkok route. Extensive air travel networks, mounting medical costs in most developed nations, long waiting time and aging population are all variable factors contributed to Thailand’s medical tourism explosion. During the last decade, Thailand has been making inroads with advancements in health care infrastructure, offering a comprehensive variety of medical tourism treatments including hair transplantation, cosmetic dentistry and plastic surgery. Competitive pricing of health care procedures in the Thailand allowed many patients from as far as the US, Europe and the Middle East to afford medical treatment and a tropical vacation. The cost of hotel accommodation in Bangkok is another attractive aspect about traveling to Thailand for health care. If there is one thing patients appreciate about dental care in Thailand is: its world-class technology. Dental technology in Thailand has revolutionized cosmetic dentistry putting cities like Bangkok at the forefront of dental tourism in Asia. Doctors and dental team members are continuously improving their skills and knowledge by taking part in the best international seminars and conventions. Dental implants in Thailand are one of the most desired cosmetic dentistry treatments because of the sophisticated technology involved and precision of Thai dentists. 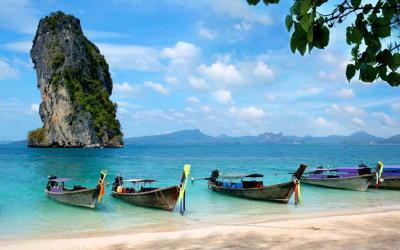 Patients traveling for Thailand dentists can rest easy knowing they are receiving the best quality dental care. The pursuit of parenthood is not an effortless endeavor. Fret not. Fertility clinics in Thailand will do their best to help you on your journey to becoming a parent. With the most qualified fertility specialists available, advanced equipment, innovative diagnostic services and extensive IVF treatment programs such egg donation Bangkok, surrogacy and gender selection Thailand programs--you are guaranteed to be one of many success stories achieved by IVF in Thailand. Pairing a plastic surgery treatment with full-sensory tropical getaway is an amazing means to look good and feel better. Against the dramatic backdrop of one the plethoric breathtaking beaches, patients seek plastic surgery treatments such as breast implants Bangkok, tummy tuck Thailand and liposuction. Thailand has become a premier destination for cosmetic surgery, led by board-certified, English-speaking cosmetic surgeons who are renowned for their technical skill and artistic aptitude. Hair loss is dramatic event in a man’s life-- and even more traumatic for women. Hair transplant clinics in Thailand offer full service facilities that are purposefully designed to treat hair loss in men and women and to make you feel welcome, relaxed and comfortable. Many male hair loss patients choose follicular unit extraction in Thailand to achieve fuller, natural and permanent results in a minimally-invasive manner. Suvarnabhumi (New Bangkok International Airport )is the International and domestic airport of Thailand, serviced by airlines from around the world. There are a number of budget, mid-range and luxury hotels in close proximity to the airport. The Tourism Authority of Thailand (TAT) highlights the most medical treatments offered in Thailand and extensive listings of reputable hospitals. TAT has recently collaborated with Krungthai Bank to offer tourists a debt card known as the Miracle Thailand Card, which entitles medical tourists medical and life insurance coverage in case of an accident.